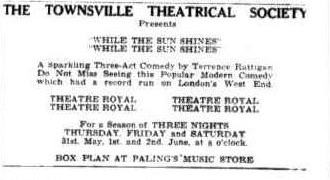 “While the Sun Shines” was performed on Friday 1, and Saturday 2 June 1951 at the Theatre Royal. W. Newman, F. Feather, J. Phillips, and G. Saunders. 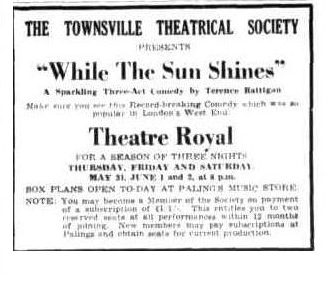 At the Theatre Royal last night the Townsville Theatrical Society presented Terrence Rattigan's bright play 'While the Sun Shines' with much good humour and enthusiasm. The large audience found it eminentIy amusing. The play brought two newcomers to the Townsville stage— Lou Sumner and Robina Brown— who performed with distinction. Lou Sumner was a 'natural' for the role of the American, and brought most of the laughter. For one without previous experience, his stage presence and timing were extremely good. Robina Brown will be a valuable addition to the Society's ingenues. She indicated a flair for drama as well as for comedy. Her wide-eyed style was most effective. Containing considerable typical Rattigan humour, the play concerns an Earl (Eric Rees), who on his wedding eve is threatened with the loss of his fiancee (Robina Brown), to either an American (Lou Sumner) or a Frenchman (Bill Wynn). Complications arise from an impecunious Duke (Chris. Lander) and a girl friend of the Earl (Beryl Stabler). Eric Rees was pleasantly boyish and ingenuous as the Able Seaman Earl. Act Three saw him at his strongest. As the girl friend, Beryl Stabler skillfully underplayed while Bill Wynn was exuberant as the Frenchman. Chris Landers' 'Duke' had a little voice trouble. Ron Forno, with a small part, was the 'Earl's man.' Production was by William Spencer. Act One was a little slow off the mark, but after that the pace did not falter. 'While the Sun Shines' has had considerable overseas success and places much emphasis on character. Last night's performers gave definite interpretations. The season will extend until Saturday night.